Spike is an anti-tank guided missile and anti-personnel missile with a tandem-charged HEAT warhead, developed and designed by the Israeli company Rafael Advanced Defense Systems and in service with a number of nations. As well as engaging and destroying targets within the line-of-sight of the launcher ("fire-and-forget"), some variants of the missile are capable of making a top-attack profile through a "fire, observe and update" guidance method; the operator tracking the target, or switching to another target, optically through the trailing fiber-optic wire while the missile is climbing to altitude after launch. This is similar to the lofted trajectory flight profile of the US FGM-148 Javelin. Cut away diagram of Spike ATGM. Frontal close-up of the Spike missile's Command & launch unit (CLU) with thermal-imaging sight, tripod mount and an attached dummy missile canister. Spike is a fire-and-forget missile with lock-on before launch and automatic self-guidance. The missile is equipped with an imaging infrared seeker. The medium, long and extended range versions of the Spike also have the capability of "Fire, Observe and Update" operating mode. The missile is connected by a fiber-optical wire that is spooled out between the launch position and the missile. With this the operator can obtain a target if it is not in the line of sight of the operator at launch, switch targets in flight, or compensate for the movement of the target if the missile is not tracking the target for some reason. Hence, the missile can be fired speculatively for a target of opportunity, or to provide observation on the other side of an obstacle. The missile has a soft launch capability – the motor firing after the missile has left the launcher – which allows for the missile to be fired from confined spaces, which is a necessity in urban warfare. The missile uses a tandem warhead – two shaped charges, a precursor warhead to detonate any explosive reactive armor and a primary warhead to penetrate the underlying armor. Currently, it is replacing aging second generation anti-tank missiles like the MILAN and M47 Dragon in the armies of the user nations. The Spike system is made up of the launching tripod with its fire control unit and the missile. There is no dedicated thermal sight on the launcher – the missile's imaging seeker is used. Altogether, the long range variant of the system weighs around 26 kilograms (57 lb). Spike can be operated from the launcher by infantry, or from mounts that can be fitted to vehicles such as fast attack vehicles, armored personnel carriers or utility vehicles. Vehicles that are not normally fitted with anti-tank weapons can therefore be given anti-tank capability. Spike has been tested as a weapon system for the SAGEM Sperwer unmanned aerial vehicle. The Spanish Army has fitted the Spike-ER to its Eurocopter Tiger attack helicopters. Both Israel and the United States have experimented with arming Black Hawk helicopters with the Spike missile; the US variant is called UH-60M Battlehawk. In order to facilitate the selling of the weapon system in Europe, the company EuroSpike GmbH was formed in Germany. Its shareholders Diehl BGT Defence (40%), Rheinmetall Defence Electronics (40%) and Rafael via ERCAS B.V (20%). ERCAS B.V. is a Dutch holding company owned 100% by Rafael. EuroSpike GmbH is located in Röthenbach, Germany. The European variant of the Spike weapon system differs a little from the Israeli version and is marketed under the name EuroSpike. For other areas of the world, Rafael Advanced Defense Systems Ltd. is solely responsible. The reusable Command & launch unit (CLU), battery, tripod and the thermal sight are common across all land-based versions (with the exception of Spike NLOS) of the Spike missile family, each weighing 5 kg (11 lb 0 oz), 1 kg (2 lb 3 oz), 2.8 kg (6 lb 3 oz), and 4 kg (8 lb 13 oz) respectively. the short range version of the weapon, is a single shot, fire and forget, disposable weapon. It is a 9 kg weapon whose minimum range is 50 m (160 ft) while the maximum range is 800 m (2,600 ft). It is equipped with a uncooled thermal seeker. A low cost display attached to the missile case allows the missile's seeker to be used as an aim sight (which allows the user to dispense with the heavier and more capable CLU). The missile is capable of 'Fire from enclosure' which makes it suitable for use in urban environments. 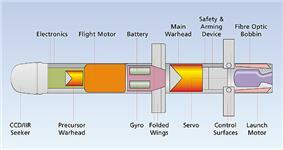 The warhead is a tandem charge design allowing the missile to defeat ERA or APS systems. the medium range version. The weight of the missile is 14 kg (30 lb 14 oz), minimum range is 200 m (660 ft) while the maximum range is 2,500 m (8,200 ft) and is used by infantry and special forces. long range version. The weight of the missile is 14 kg (30 lb 14 oz), and the weight of the complete system is less than 45 kg (99 lb 3 oz). Maximum range is 4,000 m (13,000 ft) and it is used by infantry and light combat vehicles. It adds fiber-optic communication to and from the launching soldier during flight. Reported armour penetration capability is more than 700 mm (28 in) of Rolled homogeneous armour (RHA). extended range or extra long range version of the weapon. It was formerly also known as the NT-Dandy or NT-D. It has a maximum range of 8,000 m (26,000 ft). It has a larger diameter and is heavier than the other systems, and is usually vehicle mounted. 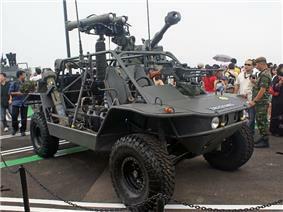 It is used by infantry, Light Combat Vehicle (LCVs), and helicopters. The Finnish Navy's Coastal Jaegers also operate the version in the anti-ship role. The weight of the missile is 34 kg (74 lb 15 oz), the launchers are 30 kg (66 lb 2 oz) and 55 kg (121 lb 4 oz) respectively for the vehicle and air-launched versions. Penetration is around 1,000 mm (39 in) of RHA. "Non Line Of Sight" is an ultra long range version of the weapon with a claimed maximum range of up to 25 km (16 mi). It is larger missile with an overall weight of around 70 kg (154 lb 5 oz) and can be launched from the ground or from helicopters. It was developed following lessons learned in the Yom Kippur War which showed a need for a high-precision guided tactical ground-to-ground battlefield missile. Codenamed Tamuz (תמוז), the first variants entered service with the IDF in 1981, though this was not revealed to the public until 2011. In a deal concluded on 6 September 2011, the South Korean government has agreed to purchase an unknown number of Spike NLOS missiles. 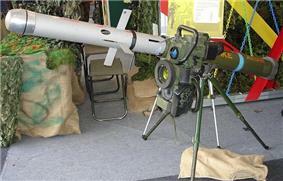 On 2 September 2009, at an IDF exhibition held at the 3rd Latrun annual land warfare conference, the Israeli Defense Force unveiled a new member of the Spike family of missiles – the Mini Spike Anti-personnel guided weapon (APGW). Rafael claims that this latest member of the Spike family of missile costs and weighs only a third of the Spike-LR, while offering a longer engagement range of 1.3 km (0.81 mi) when compared to the Spike-SR. Operators of Spike ATGM colored in dark blue. Singapore Airshow 2008, a locally developed twin-tube launcher for the Spike as mounted on a Spider Light Strike Vehicle of the Singapore Army. 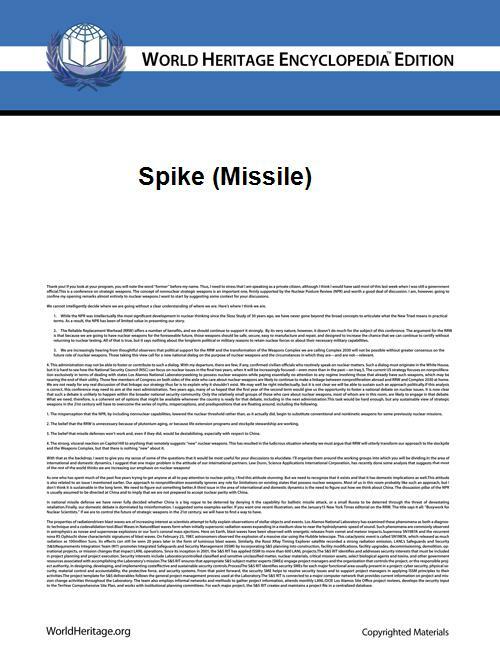 60 Spike-MR missile systems ordered. Total 300 Spike-MR/LR and 15 Spike-ER missiles. The Colombian National Army Aviation's fleet of Sikorsky UH-60 Arpia IV-series helicopters are armed with three variants of the Spike: the ER, LR and NLOS. Croatia has reportedly ordered about 30–60 Spike launchers for its Patria AMV armored vehicles. However, Croatia might opt for Javelin launchers as the new Kongsberg 30 mm Turret for Patria is fitted with Javelin launchers and not Spike. Croatia has indicated a requirement for 48 launchers as part of the Patria program with the first 16 being delivered by 2015 and remaining launchers after that. Total 244 missiles, delivered October 2009. Total 700 missiles, breakdown being 300 Spike-MR with the remaining 400 being Spike-ER. 100 MR (Panssarintorjunta-ohjus 2000) launchers plus an option for 70 more, and 18 ER (Rannikko-ohjus 2006) launchers for coastal anti-ship use. Total 4,000 Spike-LR missiles, 311 LR launchers on Puma vehicles. Defense News reported that the Indian Army wanted to order Spike missiles and peripheral equipment in a $1 billion deal. Indian Ministry of Defence officials told the magazine that the order is for 321 launchers, 8,356 missiles, 15 training simulators, and peripheral equipment. In October 2014, India chose to buy the Spike over the U.S. Javelin. The Spike NLOS was introduced into service in the early 1980s. In 1997, the Spike MR (Gil), LR (Gomed), ER (Perakh Bar) with associated launchers entered service. first contract for Italian Army was in 2003 for 53,6 million Euros: 53 launchers and 510 missile (165 of which 165 MR); second contract in 2009, 120 million Euros: 90 launchers (84 for Italian Army, 6 for Italian Navy) and 990 missile LR, of which 110 for Navy: inside 21 launchers for the VTLM Lince, 20 LR launchers for the Dardo IFV, 28 indoor and 39 outdoor training systems. 36 LR launchers with unknown number LR/ER missiles was inside the 2006's contract for the IVECO 8X8 Freccia. In 2010 Italian Army buys 800 Spike ER for 63 millions Euro, to update AW-129 Mangusta, in delivering since 2010 to 2014 (SIPRI 2013). Is expected almost another batch for 175 launchers and 2.002 missiles. Total 2,400 Spike-MR missiles, 297 launchers. Total 516 Spike-LR missiles, 48 launchers. Total 2,675 Spike-LR missiles, 264 launchers. Total 1,950 missiles, breakdown being 1,000 Spike-ER with the remaining 950 being Spike-LR. For use on IAR 330 SOCAT attack helicopters and MLI-84M IFVs. 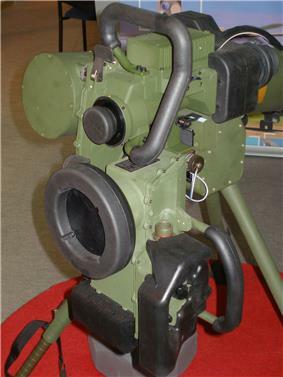 In 1999, Singapore became the second country to acquire the Spike ATGM. Total 1,000 Spike-LR missiles, with associated launchers. Spike MR/LR has been in operational use in the Slovenian Armed Forces since 2009. Total 75 missiles. Some will be on Patria AMVs. A South Korean government deal concluded on 6 September 2011 has confirmed the procurement of unspecified numbers of Spike NLOS, of which about 50 missiles will be forward deployed to the South Korean islands of Baengnyeong and Yeonpyeong, close to the Northern Limit Line with North Korea. On 19 May 2013 the South Korean military confirmed that "dozens" of Spike missiles had been deployed on the islands. The Republic of Korea Navy will also deploy the Spike NLOS on AgustaWestland AW159 Wildcat helicopters. Total 2,800 missiles, breakdown being 2,600 Spike-LR with remaining 200 being Spike-ER. 236 Spike LR launchers (option for 100 more), 2,360 missiles for Spanish army, 24 Spike LR launchers and 240 missiles for Spanish marines. Spike ER on Eurocopter Tiger attack helicopters (Spanish army). 14 M113s equipped with Spike NLOS launchers, under the codename of 'Exactor'. Operated by the British Army during the Iraq War and War in Afghanistan. In February 2006, the Czech Republic selected the Spike-ER as part of a package to arm its newly ordered Pandur II vehicles. A total of 234 Pandur II were ordered at a cost of $1.02 billion with delivery in 2007–2010. A portion of the fleet was supposed to be fitted with the Samson Remote Controlled Weapon Station which has provisions for the Spike missile launcher. In December 2007, the Czech government canceled the program, so presumably the missile order will be canceled as well. Spike is a contender along with Javelin. Spike-MR is a contender along with Javelin. In January 1998, a partnership arrangement was announced between Israeli Aerospace Industries and Kamov to market the Kamov Ka-50-2 attack helicopter in Turkish competition. One of the optional armaments being offered for the Ka-50-2 was the Spike-ER missile. Eventually Ka-50-2 lost to TAI/AgustaWestland T-129. Turkey has also examined the use of Rafael Overhead Weapon Station with Spike for its Otokar Cobra light armored vehicles. In February 2001, the British MoD awarded two contracts valued at $8.8 million for a yearlong assessment of the Javelin and Spike-MR. The Spike was being offered by Rafael Advanced Defense Systems teamed with Matra/BAe Dynamics while the Javelin by a team of Lockheed Martin and Raytheon. The UK would like to field a lightweight antitank missile system for its Joint Rapid Reaction Force by 2005. In February 2003, the British MoD selected the Javelin. The Spike was offered by Rafael Advanced Defense Systems as a possible contender in the US Army JAWS missile program in 1996, now called FOTT (Follow-On-To-TOW). The offer was rejected but there have been suggestions that the missile might be tested as part of US Foreign Comparative Trials. Spike has also been test fired from an unmanned surface vessel precision engagement module (USV PEM) operated by the US Navy as part of a project to evaluate unmanned surface combat capabilities. ^ a b "A multitude of launchers – for a multitude of use". EuroSpike GmbH. Retrieved 29 June 2010. ^ a b "Defense Update issue 2-07 (May – June 2007) : Electro-Optically Guided Weapons". Defense-Update.Com. Retrieved 1 July 2010. ^ "Eurocopter Fires Spike Missile From HAD Tiger". Spacewar.com. Retrieved 24 May 2010. ^ "Tiger HAD Enters Firing Campaign Using the Spike Missile". Deagel.com. 12 September 2008. Retrieved 24 May 2010. ^ "UAE Seeks Weaponized UH-60M 'Battlehawk' Helicopters". Retrieved 28 January 2012. ^ "EuroSpike GmbH". EuroSpike GmbH. Retrieved 1 July 2010. ^ "Multi-Purpose Missiles". Rafael Advanced Defense Systems Ltd. Retrieved 26 August 2011. ^ "SPIKE Medium Range (MR) – "Fire & Forget" for visible targets". EuroSpike GmbH. Retrieved 29 June 2010. ^ "SPIKE Long Range (LR) – "Fire & Forget" or "Fire Observe & Update" for different targets". EuroSpike GmbH. Retrieved 29 June 2010. ^ """SPIKE Extended Range (ER) – a longer range of "Fire & Forget" or "Fire Observe & Update. EuroSpike GmbH. Retrieved 29 June 2010. ^ Pfeffer, Anshil (1 August 2011). "IDF Reveals Tamuz Missile". ^ a b "Advanced Spike Missile Unveiled" (Press release). ^ Trimble, Stephen (25 November 2009). "Rafael unveils new long-range Spike missile". ^ a b 8 September 2011, Infolive.TV news report on YouTube. Retrieved 13 October 2011. 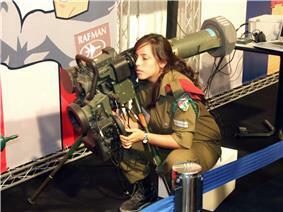 ^ "Israel Unveils New Precision Weapon Systems for the Ground Forces". Defense-Update.Com. 2 September 2009. Retrieved 29 June 2010. ^ "Mini-Spike Anti-Personnel Guided Weapon". Defense-Update.Com. 2 September 2009. Retrieved 29 June 2010. ^ "Combining EO/Laser Guidance for Small Precision Guided Weapons". Defense-Update.Com. December 2010. Retrieved 26 August 2011. ^ a b c d e f g h i j k "SIPRI arms transfer database". ^ http://www.webinfomil.com/2014/06/fuerza-aerea-colombiana-presenta-su.html. Retrieved 26 June 2014. ^ "NT Spike". Tealgroup Corporation. March 2011. Archived from the original on 5 April 2012. Retrieved 15 August 2013. ^ "Ecuadorean Army OrBat" (Press release) (in Español). Ecuadorean Army. 30 November 2009. Retrieved 1 June 2010. ^ "EuroSpike launcher – Ground – Vehicle Operation". EuroSpike GmbH. Retrieved 1 July 2010. ^ Ran Dagoni (24 March 2011). "Rafael in $1b Indian anti-tank missile deal". Globes – Israel business news. Retrieved 14 September 2011. ^ "Israel pips US in anti-tank guided missile supply to India". Times of India. 2012-11-29. Retrieved 2012-11-29. ^ "The Latvian National Armed Forces (PDF report)". ^ Pengelley, Rupert (30 June 2008). "INDUSTRY PROFILE – Volatility in the Middle East drives Israeli defence industry innovation". ^ "Army Gets New Anti-Tank Weapon" (Press release). ^ "Israeli Spike missiles deployed". The Korea Times. 19 May 2013. Retrieved 21 May 2013. ^ Pierre, Tran; Andrew Chuter (29 March 2010). "Battling for a Battlefield Missile". DefenceNews.Com. Retrieved 16 August 2010. ^ "Despite the Recent Acquisition of Javelin Missiles, France Still Undecided on Future Anti-Tank Missile Buy". Defence-Update.Com. 9 Apr 2010. Retrieved 16 August 2010. ^ "อาวุธต่อสู้รถถัง". Retrieved 23 November 2011. Joint venture with IAI. Joint venture with DSTA. Joint venture with Raytheon. Joint venture with Hatehof. Joint venture with Northrop Grumman.